These formations differ from calculi in the fact that they are made up of masses of vegetable and earthy matter agglomerated together, while the latter consist exclusively of salts which have crystallized out of the fluids of the bowels around a central nucleus. Concretions, like calculi, are rounded in form, but vary in composition, and also in their structure and external character. Two kinds of concretions are found in the horse, known as mixed concretions or clung balls, and oat-hair concretions. The former are composed of earthy - looking masses of salts, such as go to make intestinal calculi, loosely incorporated with materials of food-hay, straw, dung, the husk of oats, etc. etc. Mixed concretions (fig. 109) have an irregular, nodulated appearance. They are dark in colour, and much less dense and hard than calculi. When divided they present a rough surface, of loose texture, and in structure resemble calculi in being made up of concentric layers, but of a much thicker and coarser character. Oat-hair concretions are composed of the fine downy hairs which cover the kernel of the oat, and not, as is universally stated by veterinary writers, of the "beard of oats and other grains". This formation, like the others, is also rounded, but its surface is regular, and of a soft velvety character. It sometimes occurs that the hairy surface of the concretion becomes covered by a layer of earthy matter, the same as that composing intestinal calculi, when like them it is rendered smooth and polished, and presents the same outward appearance. It is, however, readily distinguishable by its lightness, and by the woolly texture it displays on section. 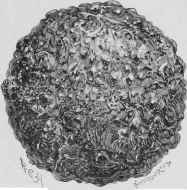 When a minute portion of this concretion is submitted to the scrutiny of the microscope, it is found to be made up of small slightly curved vegetable hairs, one extremity of which is pointed and the other broad and somewhat square. Fig. 109. - Mixed or Conglomerate Calculus. What are the conditions which lead to the aggregation of these small bodies, in some instances to the almost complete exclusion of other matters, contained in the bowels, it is impossible to say.